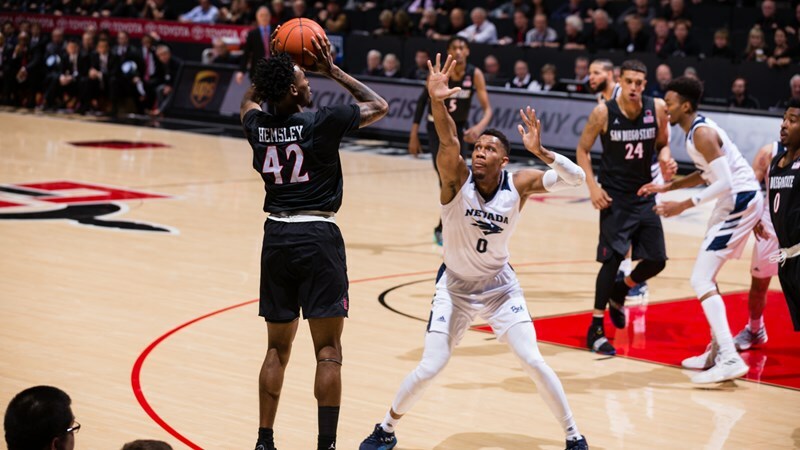 Despite being cold with their shooting, the San Diego State Aztecs still managed to beat sixth-rank Nevada Wolf Pack, 65-57, in front of a raucous home crowd Wednesday night at Viejas Arena. SDSU (17-9, 9-4 Mountain West) shooting was just 39.7 percent, making 25 of 63 attempts from the field, but that was enough to beat Nevada (24-2, 11-2). This was the third straight time SDSU has beaten Nevada and also the highest ranked team the Aztecs have beaten. Fans in the stands were chanting “Overrated” and rushed the court when the game ended. For their part, the Wolf Pack made only 19 of 56 shots for a 33.9 shooting percentage. Nevada was held to its lowest points total this season. The only other time it was held to lower score (56) was against SDSU on Feb. 12, 2017. Midway through the second half, the Wolf Pack was trailing by 16 points but rallied to within single digits, 55-60, in the closing seconds. Jeremy Hemsley and Devin Watson, however, put a stop to that. Hemsley made a layup with 29 seconds to go followed by a free throw on a foul by Jordan Caroline. After a layup by Nevada’s Cody Martin, Watson made two free throws on two separate fouls to end the game. Hemsley and Watson both finished with 15 points each for the Aztecs. Martin had 20 points for the Wolf Pack. Two of the best scorers on each team, Caroline and Jalen McDaniels, did not score at all in the first half. Caroline finished with eight points and McDaniels with 10. “I thought he got to his spot a couple times in the second half, but you have to realize that Nevada knows he’s our best player and they had their best defenders on him,” Dutcher said of McDaniels. Up next, San Diego State travels to Las Vegas to face UNLV at 7 p.m. Saturday.